As with most passengers the Radicals are increasingly frustrated with Southeastern. Admittedly we were before the recent debacle but the Southeastern response is symptomatic of the other issues that long-suffering passengers have had. Namely a disinterest in offering a good service. We believe the customer satisfaction surveys for this year would not have been good before the current event and predict Southeastern will shrug off poor results (as they have in the past) by blaming this one incident. The problems identified by the Radicals are summarised at the end of this post and include possible solutions if we were half-heartedly running a train franchise. The response by passengers indicates clearly the inadequate response. It is unfortunate that we do not have any faith in Southeastern improving the situation or learning from this farce. We need an external review of how it has been managed. This is not the first time Southeastern have been below standards expected by customers and without being held accountable it will not be the last. It also raises serious concerns about how Southeastern will manage the major disruption caused by London Bridge works. We appeal to local elected representatives, particularly Heidi Alexander MP, to lead, advise, question, and assist with a concerted effort using the relevant regulators, ombudsmen, and passenger groups to ensure Southeastern provide an acceptable service to passengers who pay up to and over £1,000 a year to use the service from Blackheath. In all, it has been a shambles and unfortunately comes as no surprise to most that Southeastern are simply not up to the job. We fear that no matter how much complaint there is there will be no improvement. But we hope that further pressure can be exerted on Southeastern by passengers, local authorities, and local business, who all have an interest in a reliable and efficient train service. Delay repay is a bit of an insult to season ticket holders in this instance. This work constitutes massive daily disruption for people. Travelling at different times, some people have to make up time at work, manage children, etc. This Radical fortunately has some flexibility but the revised commute means getting a much busier than normal train from Blackheath to Charing Cross and arriving at work c20mins later than normal. 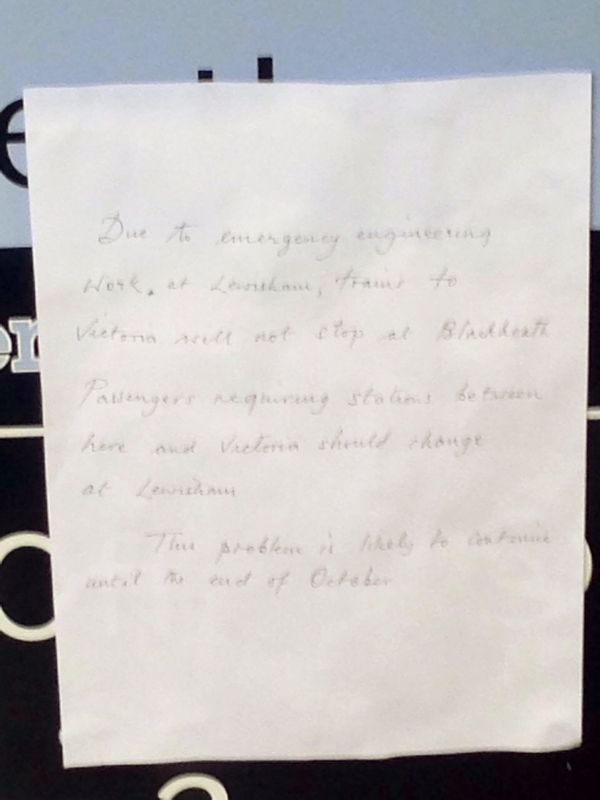 Given many have only been able to travel to and from Lewisham Southeastern should be offering a season ticket refund of the difference between using Blackheath and Lewisham, which is considerable. The Radicals have a query out with Southeastern on whether the new timetable means delay repay is still valid under the revised timetable. For example, if a passenger normally travelled on the 08:42 Blackheath arriving Victoria at 09:06 – a journey of around 26mins. The closest alternative service is the 08:48 arriving Charing X at 09:12 and then the tube from Embankment means that arrival at Victoria would be at around 09:29 (according to National Rail Enquires). So delay repay should compensate every day for that passenger being 23mins late. However, if the 08:42 technically no longer exists due to the revised timetable then delay repay we are concerned that delay repay does not apply. If the latter is the case then Southeastern have shown a crass disregard to passengers. The revised timetable is laughable. The remaining Victoria service is clearly inadequate and leaves many stranded at Lewisham. The initial suggestion was that Victoria services would be diverted. It is not clear that they have been or if they have just been cancelled. Most people travelling to and from Victoria get to Lewisham and report that they can’t get on a train due to over crowding or have to wait a long time for a service. Why not put on extra services? Again, Southeastern messaging has been mixed. If the service is not up to it then Southeastern should admit this and advise people to avoid changing at Lewisham for Victoria services and use Charing X.
Southeastern should also have considered alternative options for getting from Lewisham to Blackheath (apologies to those further down the line, but focussing here on our area of operations). Southeastern should be working with TfL to offer an enhanced bus service, or putting on a shuttle replacement bus to operate at least between Lewisham and Blackheath – at the moment it is often faster to walk between the two stations. Tickets should also be valid on bus routes from Lewisham to Blackheath and further down the Bexleyheath line (for example the 89 serves a similar route to the train). Tickets are valid on Circle/District Line between the mainline stations which is of some use, but can it be used for stops on that route e.g. more efficient to get tube to/from St James’ Park and Embankment than go all the way to Victoria and double-back on foot. Equally some may find it faster to go from London Bridge to Westminster on the Jubilee. The initial response was slow, poor, and confused – and still is. A week and a half in to the work and messages still state it will be ‘at least four weeks’ . At Blackheath there has been the addition of plain, black and white A4 notices at the bottom of the steps at Blackheath. This may be at the initiative of the station staff (which is laudable) but prominent official signage and apologies are required – TfL seem to be able to do it on the tube. Posters that have recently appeared are lengthy and wordy. Why not put up simple and clear posters with information that are clear and easy to read? The type of engineering work is a side issue and the focus of posters should be on which services are cancelled, alternative route advice, and compensation. The things that actually matter to passengers. This should have been done by now. We would also like to know what compensation Southeastern is getting from Network Rail. For transparency and accountability this should be released. Where does this go? Simply back in to profits? Losses will presumably be limited since most people are still having to use Southeastern. If they can show a dip then fine, use the part of the compensation to cover that, but the rest should be reinvested to provide a better ‘passenger experience’. This feels a bit like a rant, but Southeastern seems to bring out the worst of us. It would also be good if some of our elected representatives could take a look at the recent decision by Southeastern to increase rents for the coffee stands at Charlton and Greenwich stations (and, presumably, elsewhere – these are just two that have been flagged up this week); which looks to have led to the closure of these businesses. If the leasing costs are too high to make a coffee stall viable at a station as busy as Greenwich, then what hope is there? Southeastern need to explain what their plan is for these stations – or are they simply trying to extract as much rent out of small businesses as they can? We were concerned at one point that the newsagent at Blackheath station might have been deterred be higher rents, possibly associated with the station’s refurbishment. After a brief hiatus it was a relief to see them return a few weeks ago. Still, you raise an important point – there’s retail space in the waiting room at platform 1 that has been empty since the refurbishment. Tempting to give John Payne a call and find out what the rent is.